Cally Jane Beech first hit our screens for the revival of ITV's dating reality show, 'Love Island', which saw the former dental nurse meet up with Luis Morrison, who she had previously dated before meeting again on the island. The couple, who are still going strong, are the only remaining couple from their series. At home, Cally's family dogs give her a sense of continuity, love, trust and lots of laughs. 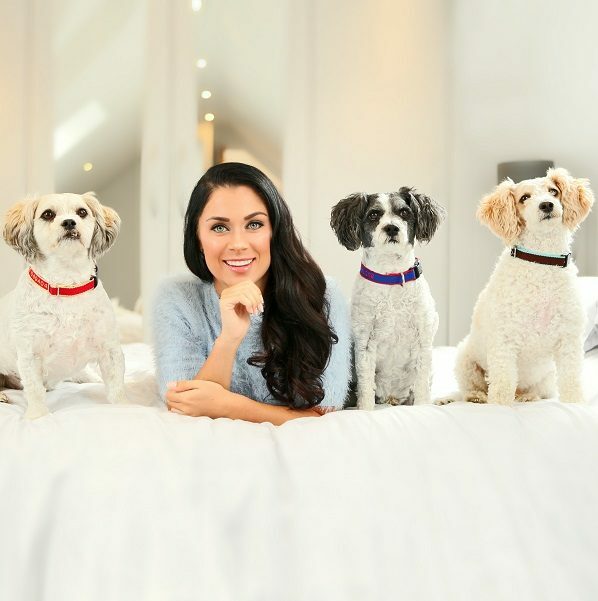 Kim O'Meara caught up Cally to find out more about her three dogs and to ask her what she's made of the current series of 'Love Island'. Hi Cally! Thanks so much for making the time to speak with us today. I know you have three much loved family dogs - tell us more about them. Hi! Yes we do. Busta is the oldest, he's 10 years old and we had him first. Murphy is 6 years old and Alfie is the youngest at 2 years old. We've had them all from puppies and they are all Bichon Frise, Shih Tzu cross Poodles. Aside from the boys, did you grow up around animals? (Laughs) My brother, mum and I tried for years to convince my dad to allow us to have a dog. My mum has asthma, which is the reason we went for dogs which wouldn't molt. Anyway, one day we asked again and he said 'oh, go on then, but they're your responsibility' and my mum and I flew out the door (laughs) and we got Busta. Ten minutes after we got home, dad was on the floor lying next to Busta and talking to him. It was so funny, he's really soppy with them and calls them 'the boys'. We can't imagine home without them now. We have three because when we had two my mum was worried that when one passed away the other would be heartbroken on their own, so we got Alfie. Who's the funniest of the boys? They're all individual, they all have their own characters. Busta's the older man and Murphy's quite quirky. Alfie's quite a sensitive, anxious boy. We've had him since he was a baby and he was the runt of the litter. When we went to see him and his siblings, he was the only boy, he was sitting in the corner on his own and he looked like he'd been pushed out. His teeth hadn't come through and he hadn't fully developed. I always want to help animals so as soon as I saw him, I knew I wanted to take care of him. He's so, so spoilt but we have to explain about Alfie though when anyone comes because he'll sometimes just let out a squeal and someone will say 'I didn't do anything, I've just sat down on the sofa' and we have to explain he sometimes just does it, and not to worry. I imagine your life has changed quite a lot over the last year and you miss the boys when you're not at home. I do, they're part of the family. I live in London now so I really look forward to going home and seeing them. They're always happy to see you, it's quite refreshing. They're never up or down, they're always just excited and happy to see you and say 'hi'. They sound like real characters! If the boys had motto's which they lived their lives by, what would theirs be? And of course the same question to you. (Laughs) I think there's would be 'eat, sleep and have fun'. They have a really good life with lots of love and our family home has lots of places, such as fields, for walking. They're happy little dogs. I live my life on the basis of 'love the people who love you' and 'make every day the best day' so I think that's what mine would be. I think the boys would echo the second one as well. We can't speak without asking you about this year's 'Love Island'. I know you've been watching the show, so what do you think of it so far? (Laughs) In truth, it's really odd. Quite surreal, really to be watching a new group of people in the same house with the same cameras we were in, but with some small changes. Obviously last year was the first year it was showing after coming back so it was brand new really. This year LI seems to be dropping more bombs on the couples, I think we were quite settled. Does it make you miss the experience? It's definitely weird to watch but it does make me miss it and say 'bless them'. This year's show is I think ten times bigger because it's more known. Our series grew in audience figures week on week, which was great for ITV, so this time around I think people were ready. I think it's one of those shows you can get addicted to and people keep watching. Except for your other half, Luis, what else did you take from the experience? Well, we're the only couple still together from last year's show. I think it's something that having experienced together can really bring you together because you both have the same shared experience. What about this year's cast? How do you think they'll do? I know quite a few of the people. I think the experience there compared home is very different. In the house you're together 24/7 and you have a strong bond there, but when you're outside of the house it might feel very different. Because our series was the first, I think this being the second with bigger audiences and it being a bigger, more known show will give lots more opportunities for them than we had to be honest. You were crowned 'Miss Great Britain' in 2012 and your modelling career has continued to grow. As a well known name, how important is it for you to be involved in spreading the word about causes close to your heart? Very important. Particularly animal welfare causes. My mum and I always used to struggle to drive past an animal rescue without going inside to give out treats and cuddles and now with things such as Yulin becoming so well known, it breaks my heart to see and think of these animals suffering. I always say if I could run the world I'd stop animal suffering first. If you could sum it up, what do you think is the best thing about owning a dog? They're very calming and loyal. They mean the world to me.